Atheist Society of Nigeria promised to roll out a short series targeted at demystifying the Nigerian populace about so-called juju, jazz and black magic. 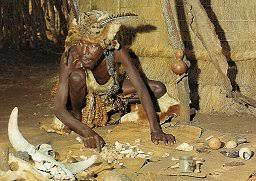 This article is the third in the short series on A Scientific Slant on Juju and Black Magic. It is a great idea for you to look through the pages of this blog to be kept up to speed on the previous two. This particular article wishes to throw more light on a much-feared form of Juju in Nigeria: juju bundle. Stories abound of people travelling to their villages during festive periods and returning gravely ill, insane, paralyzed, or even dying in the process. Naturally, the more superstitious the mind of the listener of such stories, the more fearful he would be of going home and visiting his roots. This need not be so. "Atheist Society, I know you all are very rational and intelligent, but here you all have got it wrong. I have an Uncle who personally experienced such an unfortunate event! How do you account for that?" There is a plausible explanation for this ‘mysterious phenomenon.’ Read on to learn more. First of all, you might want to go back to your basic biology and remember that skin absorption is a route via which toxins can enter the human body. Skin absorption can be via the skin, glands, or even hair follicles. Not only that, toxins can be inhaled and enter the human body. This is very simple if someone wishes to eliminate a perceived enemy. It is not mumbo-jumbo, nor is there any wizened old man in a cave conjuring up demons and using objects as a point of contact. What kinds of objects are used in Contact Poisoning? Anything that the human imagination can dream of is used in contact poisoning. People have been claimed to use feathers, cowries, powder, blood… anything! The important thing is the poison smeared on the object must be such that skin contact with it will result in lethal effects. "But I’ve heard of instances there was no physical object the victim stepped upon or handled! He hugged a relative and that was it!" There is yet another explanation for this scenario. There are some forms of contact poisons a mischievous person can smear on a part of clothing and physical contact with another person via hugging can result in lethality for the intended recipient. The Dalai Lama addressed British Journalists about such a mischievous plan targeted at him in 2012. Does this mean a person is to fear travelling to her village due to fear of contact poisoning? No. Fortunately for most people, the extremely sophisticated form of contact poisoning described by the Dalai Lama, is very lethal. So lethal that even the mischievous person who wishes to harm another person with it will also have reason to fear being poisoned in the process. It would be tantamount to cutting off your nose to spite your face, won’t it? As for the more common forms of contact poisoning, it is always a good idea to avoid touching unfamiliar objects with your bare hands. If your fear of the contact poisoning is well-founded and not rooted in paranoia, then avoid all forms of direct contact with the juju bundle by using gloves when you wish to remove it from your property. In some cases, gloves don't protect you from contact poisons. This is because some forms of contact poisons are so lethal that they penetrate latex gloves. To be humorous, if you are really sure you’re not being paranoid, you might want to get something similar to a hazmat suit to wear prior to removing the juju bundle suspected of containing contact poison from your premises. This Hazmat Suit will cover you from your head to the tip of your toes. Even your extremities (fingers, ears, and toes) will be adequately covered. But seriously, anybody who has real reason to fear others using juju bundle contact poison on his home and work premises will want to take a step back to reappraise his pro-social skills! What kind of mischievous activities do you yourself get up to? Honestly, it’s only public figures who have legitimate need to fear juju bundle contact poisons, as their line of activity exposes them to intense hatred. Check yourself: are you sure you are not just being paranoid?